One of CCF’s most popular and effective educational activities is Livestock Kill ID - Correct Identification of Livestock Loss based on studying how the animal was killed. 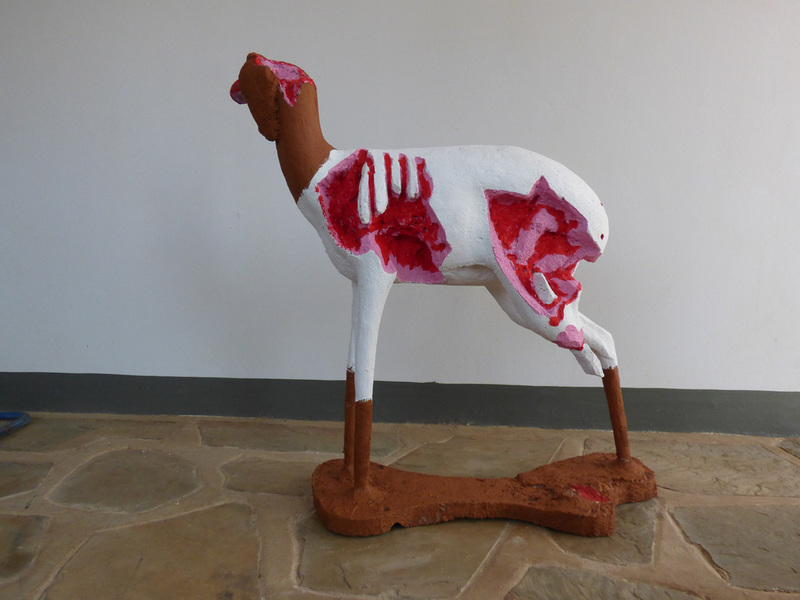 With the help of an educational grant I was able to order new Kill ID goats, which are steenbok molds that are used in taxidermy that are then transformed to look like Boer goats. The “goats” cost N$2,000 a piece and were a much needed replacement for our deteriorating “goats” that were an estimated 15 to 20 years old. With my guidance on how each predator would kill and eat the goats, Bobby carved them up and I painted them with gore. We completed 6 new goats that were "killed" by they're respective predator; cheetah, leopard, domestic dog, jackal, and added 3 new predators to the activity: caracal, brown hyena, and african wild dog. We do this activity in Namibia with farmers, educators and students paired with a presentation and lecture about carnivore ecology and human-wildlife conflict. I have made this activity available on CCF’s website under the education section found at this link below. The lesson is designed to introduce students to the concept of Human-Wildlife Conflict and stimulate discussion about ways to minimize conflict and ways to co-exist with wildlife. Included is the power point presentation “Understanding Human-Wildlife Conflict and Correct Identification of Livestock Loss” that you can modify to fit the grade level you are presenting to. Also included is the interactive activity "Kill ID" with chart and paper goats I have made as examples and for your use. The gray area on the goats represents the areas consumed by the predators - similar to the shaded areas in the chart’s “parts eaten” column. I have also attached a blank goat for those with better art skills than myself or if you want to add local predators in your area to the activity- such as cougar and coyote. I suggest this lesson for grade 4 and above.